Birthday cakes for dogs come in all different sizes, shapes, colors, and themes. Thanks to the wonderful variety of cake pans available, you are only limited by your imagination. You can make bone shaped cakes, paw shaped cakes, use fire hydrant mold or dog house molds to name a few. 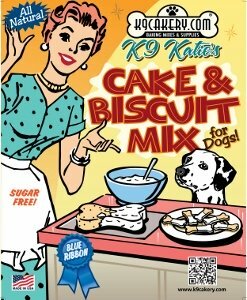 Click dog cake recipes and dog birthday cake recipe ideas to find recipes to make your own dog cake. We wanted to feature some of the more creative dog birthday cakes we have come across. These cakes are decorated using Fido's Frosting. 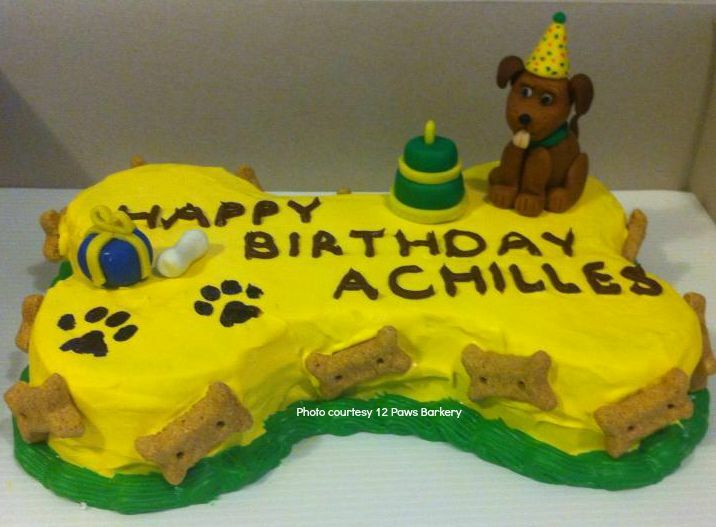 This beautiful cake celebrates the birthday for a dog names Achilles and is made by 12 Paws Barkery. 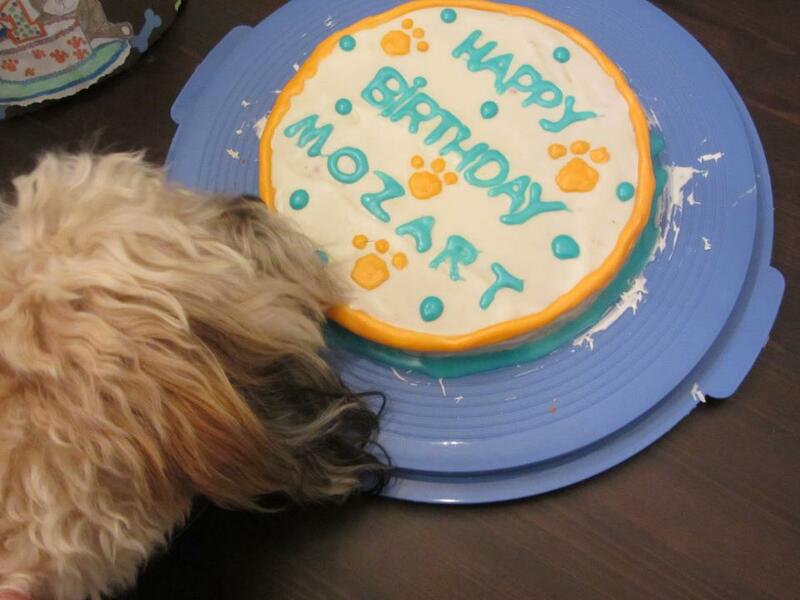 Mozart is singing a happy tune to his birthday cake. He gets to eat it all by himself. This is another example of a simply decorated cake with Fido's Frosting and Mozart is likely going to eat every last crumb. Dog cupcakes are easy to bake and decorate. You can easily and quickly make cupcakes in a portable cupcake maker, or bake them the traditional way in the oven. 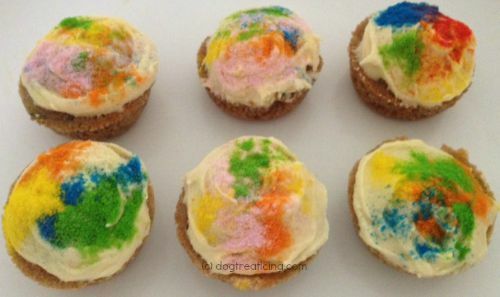 Then simply mix up dog treat frosting, frost, and decorate with edible glitters or sprinkles. Color the frosting any color you desire. 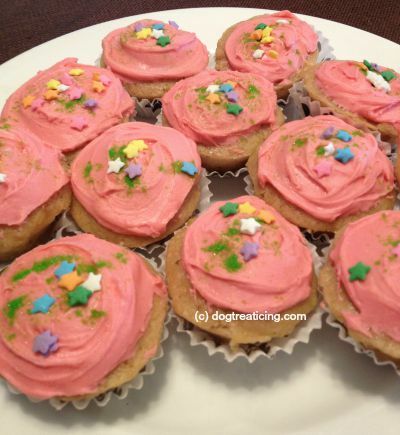 To decorate dog cakes and cupcakes, we recommend using a dog cake frosting made specifically for pets. Although the cake ingredients are human grade, and you can eat the cakes yourself, you may not wish to give your pet the same cake frosting that is designed to be palatable for the human tastebuds. Pets have a heightened sense of smell and are attracted to food items that smell good to them. They don't really care if it has sugar for that sweetened taste like humans prefer. We have known pets who "steal" the packages of dog cake frosting and eat the powder right out of the package. The frosting works the same way as you are used to, only it contains ingredients that are safe and recommended for pets. It will dry hard and does not require refrigeration. It retains its shape so you can easily decorate and make special designs, write names, and of course frost a cake quickly and easily. 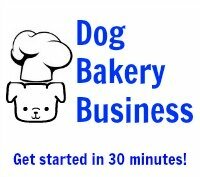 Click here to see more dog cake icing options.